Michael Bisping Enough to Bring Nick Diaz Out of Retirement? During Monday’s UFC 166 luncheon in Los Angeles, Gilbert Melenedez suggested buddy Nick Diaz (pictured) might come out of retirement (again) if the “right opportunity” presented itself. In “Breaking Bad” lingo, that means a big fight so he can make some fat stacks, yo. After catching wind of a possible Diaz return, middleweight Michael Bisping promptly threw his name in the hat for a crack at Mr. 209. “Well if Diaz wants a fight at 185 I would happily welcome him to the division,” Bisping wrote on Twitter. Bisping is a seven-year UFC veteran with 19 bouts inside the Octagon. Although, while “The Count” owns an impressive 24-5 professional record, he’s never fought for the UFC belt, let alone donned one. So, is a bout with Bisping big enough to lure Diaz back into the cage? I’m guessing, no, especially since a scrap against former UFC light heavyweight champion Lyoto Machida wasn’t enough to bring Diaz back. On the flipside, what will it take to get Diaz’s fighting juices flowing again? The only reason he came out of retirement after losing to Carlos Condit for the interim welterweight title was because he was offered a blockbuster bout against reigning UFC welterweight king Georges St-Pierre. That decision was a no-brainer: Care for an opportunity at the throne en route to the biggest payday of your life? Yes, please! However, Diaz has lost two consecutive tangos so an immediate title shot is out of the question (one would believe, but sometimes you never know with the UFC). 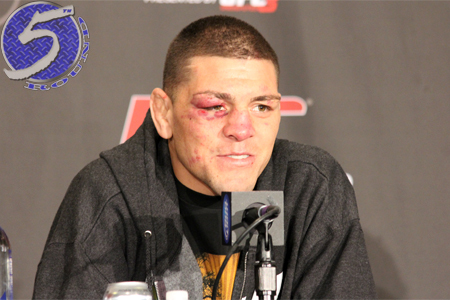 For now, Diaz appears content with simply competing in triathlons and living off his UFC 158 money. Although, that dough will eventually dry up and he’ll need to replenish his bank account by taking another fight. That time doesn’t appear to be now, and Bisping doesn’t appear to be the right opponent to do it against. Just don’t tell that to UFC president Dana White, who tweeted,”I love that fight,” in response to a fan who asked him about the potential contest.